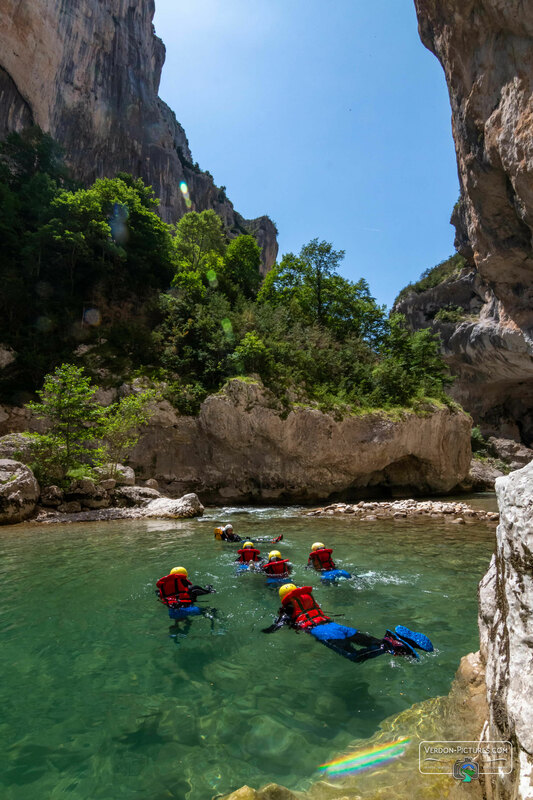 On a full day aqua trekking, discover the entrance of the Verdon Grand Canyon! This whole day trip in the Verdon Gorge is a combination between two half day trips, the "Pont du Tusset" and the "Couloir Samson". The first one is suitable for families in summer, but in spring, the water level is higher so more sportive. There is many jumps (until 8 meters) and very nice deep pools. The lunch area is located at the entrance of the "Grand Canyon". Enjoy more than 400 meters of cliffs around you !! In the afternoon, you will ride the "Couloir Samson", with many rapids, and a wonderful scenary. Cost : 60€/person in low season. Private tour : 480€ (low season). Period : From june to september, every day in case of no water release by the dam. In summer, this trip is not available. - Discovery "Pont de Tusset"
- Half day "Couloir Samson"
- Day "Pont du Tusset" + "Couloir Samson"
(*) : High season from july 1st to august 31st.